In a small saucepan, toast ginger, cinnamon, and nutmeg until fragrant over low to medium heat. 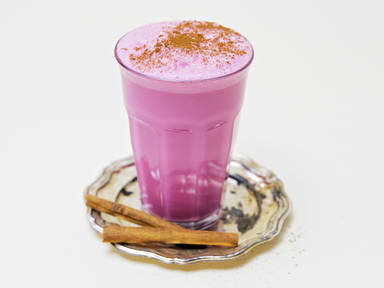 Whisk in almond milk, beetroot juice and maple syrup. Bring to a simmer. Whisk again until frothy. Pour into a glass and sprinkle on extra cinnamon to taste.